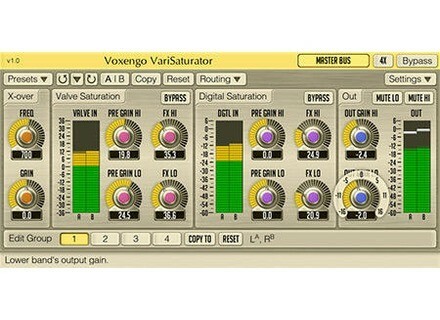 VariSaturator, Software Distortion/Overdrive from Voxengo. Voxengo VariSaturator version 1.10 update is now available for download. VariSaturator is an audio effect plug-in designed to apply saturation and overdrive effects to audio material. VariSaturator is available in AudioUnit and VST plug-in formats (including native 64-bit support), for Mac OS X (v10.5 and later), and Windows computers. Note that on Mac, VariSaturator now supports Mac OS X v10.5 and higher only, running on Intel processors. Mac PowerPC support is not available. Plug-in's popup-windows now recover last position after reopening. Post-output gain "Sat" saturation switch added. Cakewalk Z3TA+ 2 for Mac Cakewalk announces that the Z3TA+ 2 Waveshaping Synthesizer is now available for Mac. Voxengo GlissEQ 3.6 Voxengo GlissEQ version 3.6 update is now available for download. Distorque Vitamin C Distorque has released Vitamin C, a free emulation of an Orange Squeezer guitar compressor.